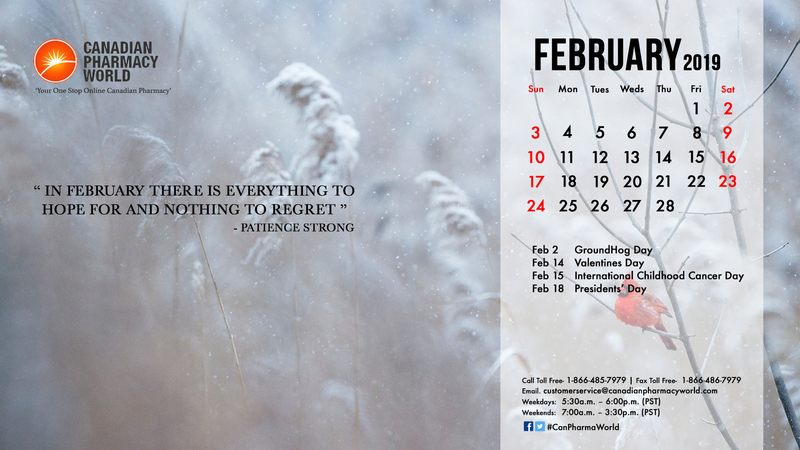 Download your monthly Canadian Pharmacy World Desktop Calendar here and see the month at a glance. Save the dates for important holidays and our Canadian Pharmacy details at a glance. 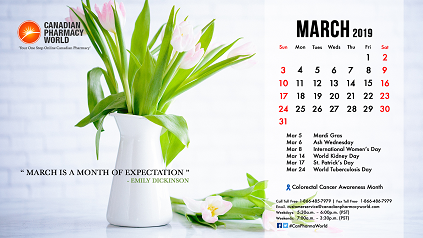 Check out our latest calendars for the year! Spring is finally here and with it April Showers and Easter Bunnies! Download your April desktop calendar from the best online Canadian pharmacy Canadian Pharmacy World. 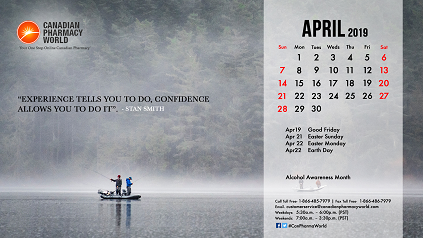 Brighten your home, work computers and don’t forget to share this inspiring calendar from your Canadian Pharmacy. 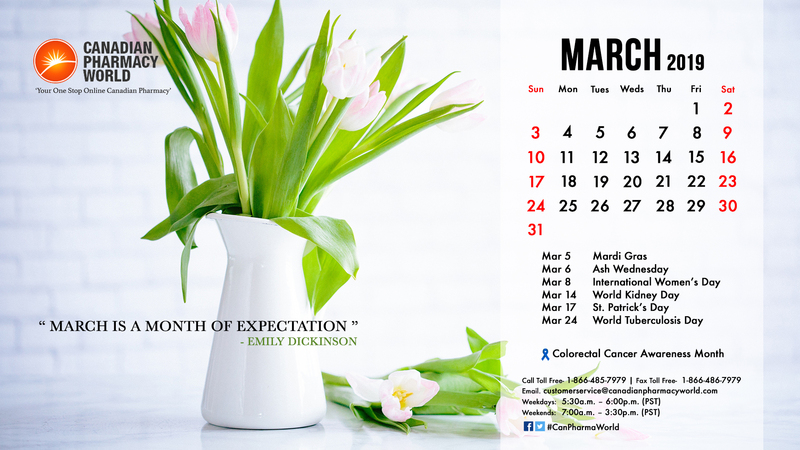 Download you March Desktop calendar compliments Canadian Pharmacy World. Enjoy your March Mardi Gras, International Women’s Day and St. Patrick’s Day. Share with your friends the great services of your favorite Canadian Online Pharmacy. It’s finally Spring! 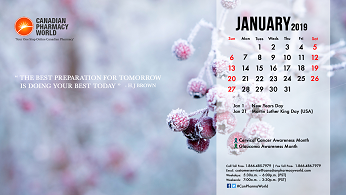 Canadian Pharmacy World is brightening your desktop with a new calendar for the new month! Download your favorite Canadian online pharmacy screensaver before Groundhog Day or make it an early Valentines Day Gift. 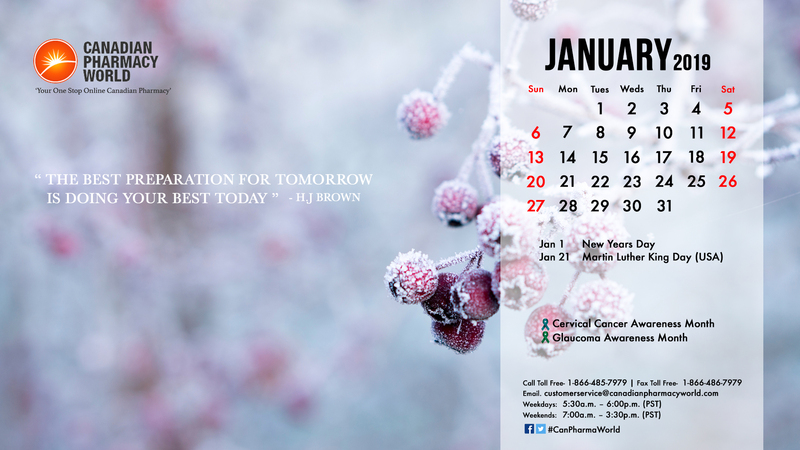 Welcome the New Year with your customised Desktop Calendar from Canadian Pharmacy World, the best Canadian online pharmacy. Meeting your whole family’s needs, this Canadian pharmacy will brighten your everyday sharing important dates and events. Download and share!